MOSCOW, April 3. /TASS/. 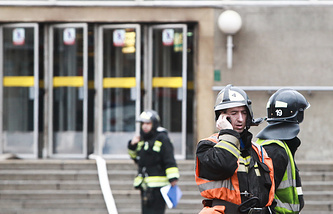 According to latest data, 14 people were killed and 49 hospitalized following the St. Petersburg metro blast, the Information Center of the National Anti-Terrorist Committee (NAK) has told TASS. "At the present time, security services and law enforcement agencies continue taking prompt measures to ferret out and prevent possible terrorist threats," the committee said. "Teams of specialists from the central office of the Federal Security Service, the Interior Ministry and the Emergency Situations Ministry have been dispatched to St. Petersburg to help in the investigation of the crime and in efforts to deal with the aftermath," it added. "Authorities and local government bodies are taking necessary measures to maintain order and stabilize the social-political situation in the city," the Anti-Terrorist Committee said. "Within the framework of the investigation, measures are being taken to establish all the circumstances of the crime, to find the perpetrators and masterminds of the terrorist attacks as well as their accomplices." A bomb went off on Monday afternoon in a tunnel between two metro stations - Tekhnologichesky Institut and Sennaya Ploshchad. "The chairman of the National Anti-Terrorist Committee has issued instructions to beef up protection of transport facilities and infrastructure as well as heavily-congested areas against terrorism," the officer said. "This made it possible to avert another grave crime with fatalities," the NAK said. "The airport has tightened security measures, including security control at the airport’s entrances and preflight inspections." "I think the FSB's experts together with detectives will quickly investigate the circumstances," he said. "All necessary measures to ensure the safety of citizens are being taken. We will do everything to avert other possible explosions or other criminal acts," he added. "At the moment, we can say this is an unidentified explosive device, as investigators and bomb specialists of the Federal Security Service (FSB) must clearly define the cause of the blast," Przhezdomsky said.